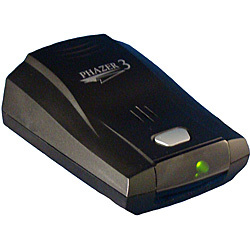 The PHAZER 3  is the only high performance top quality all bands radar and laser jammer. The jammer makes your car invisible to both radar and laser and works so well it is backed by a one-year manufacture ticket rebate guarantee. You get a ticket, the manufacturer will pay it. The radar component works by mixing an X, K, or Ka radar signal with an FM "chirp" and bouncing it back at the squad car by way of a wave-guide antenna, effectively confusing the computer inside the radar gun. The laser component transmits an infrared beam that has the same effect on laser Lidar units. The Phazer 3 has a 2 - 3 mile scrambling range giving you time. To make speed adjustments well before you hit the danger zone. Does it really work? If you get a speeding ticket within a year while using the Phazer 3, the manufacturer will pay the fine. Made in the USA Complies with all FCC regulations. The scrambler is illegal in CO, UT, CA, NE, OK, MN, IL, TN, VA and SC and Washington, D.C. It's legal in some provinces of Canada and many foreign countries. © 2019 Radar-Jammers-Detectors.net All rights reserved.